Pioneer Square — After more than 20 years absence from Seattle, the now gigantic kaiju and former Sonics mascot known as the Wheedle emerged from Elliott Bay to crush the Viaduct, destroy the boring machine known as Big Bertha and with it, the entire viaduct replacement Tunnel project. The Wheedle was visiting Seattle to celebrate the opening of a Godzilla film festival sponsored by the Seattle International Film Festival, featuring the many films of his grandfather, famed Japanese movie star Godzilla, and the later series featuring his father, Godzooky. 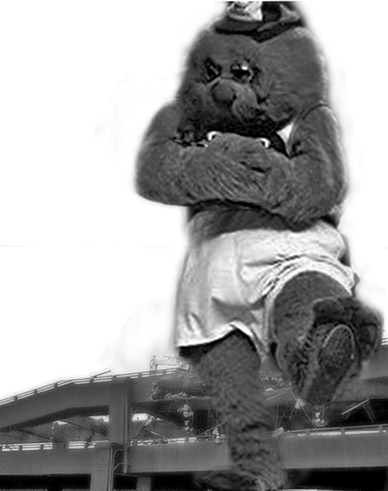 The Wheedle discovered that the Supersonics, for which he had been a mascot during his childhood (during its coinciding championship years) had been stolen by a group of Oklahoma City rustlers and bushwhackers aided by a tyrant named Stern the Merciless and numerous cowardly local politicians. Like many Sonics fans, he went on a perfectly understandable bender and subsequent rampage ending in the destruction of the Viaduct and Tunnel. Noted physicist and UW nuclear lab spokesman Dr. Melchizedek P. Blunderbuss urged calm, noting that since several small animals, insects, and birds snuck into to the UW’s atomic pile project in recent months through an open window, if the Wheedle ever returns to destroy the city, the UW would have a Mothra, Rodan, Baragon, and several giant squirrels with which to fight him or any other giant kaiju off in the future. In a related story, Mayor Murray’s spokesperson Jeff Reading said the destruction of the tunnel could be laid at the feet of former Mayor McGinn for creating “a climate of anti-tunnel hysteria.” No one this reporter could find had anything good to say about the viaduct.